An arborist by definition is an individual who is trained in the art and science of planting, caring for, and maintaining individual trees. An arborist is a specialist in the care of individual trees. Arborists are knowledgeable about the needs of trees and are trained and equipped to provide proper care. Hiring an arborist is a decision that should not be taken lightly. Proper tree care is an investment that can lead to substantial returns. Poorly maintained trees can be a significant liability. Pruning or removing trees, especially large trees, can be dangerous work. Tree work should be done only by those trained and equipped to work safely in trees. ?With our certification we can provide the best possible treatment for your trees. To earn an ISA Certified Arborist credential, you must be trained and knowledgeable in all aspects of arboriculture. 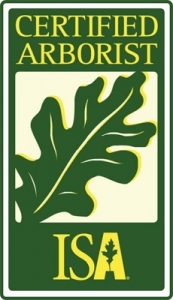 ISA Certified Arborist have met all requirements to be eligible for the exam, which includes three or more years of full-time, eligible, practical work experience in arboriculture and/or a degree in the field of arboriculture, horticulture, landscape architecture, or forestry from a regionally accredited educational institute. This certification covers a large number of topics giving the candidates flexibility in the arboricultural profession. A code of ethics for ISA Certified Arborists strengthens the credibility and reliability of the work force. This certification is accredited by the American National Standards Institute, meeting and exceeding ISO 17024.